The Bike Station offers daily guided tours in 2-4 different levels. Each guest can then choose, on the eve of the tour, the tour that best suits him to meters of elevation, kilometers and difficulty. 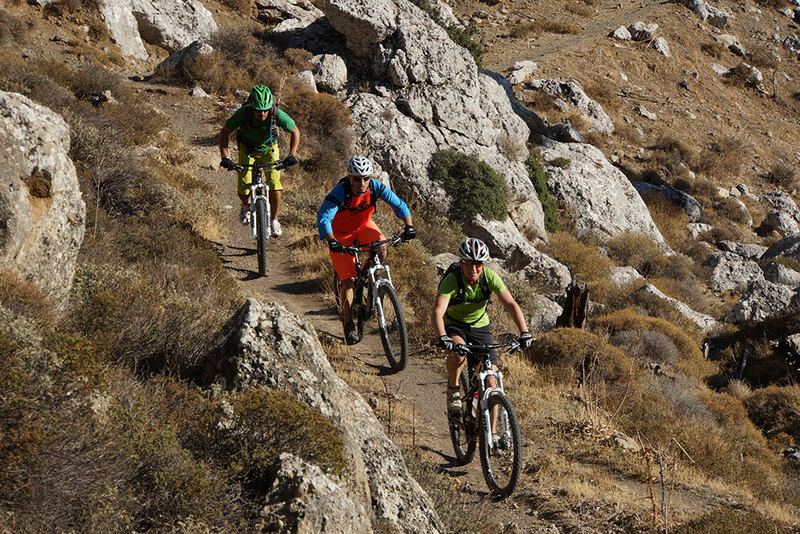 The package includes 5 guided mountain bike tours across various parts of eastern, southern and central Crete, some tours with a bus transfer to more distant areas. The lower "levels" may often spend a little longer on the bus to reach the starting point of the tour. 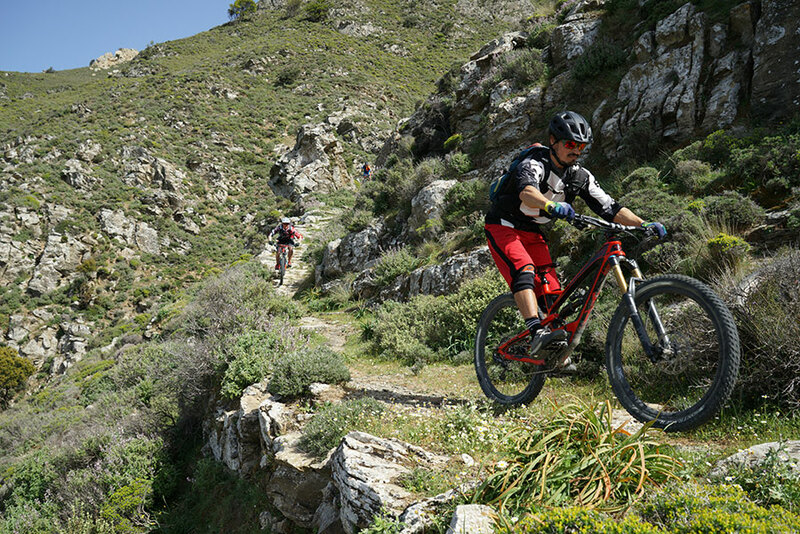 We explore the bizarre Sitia mountains, with deep gorges embedded in untouched landscapes. The countryside and people give you a feel for the nearby Eastern cultures. 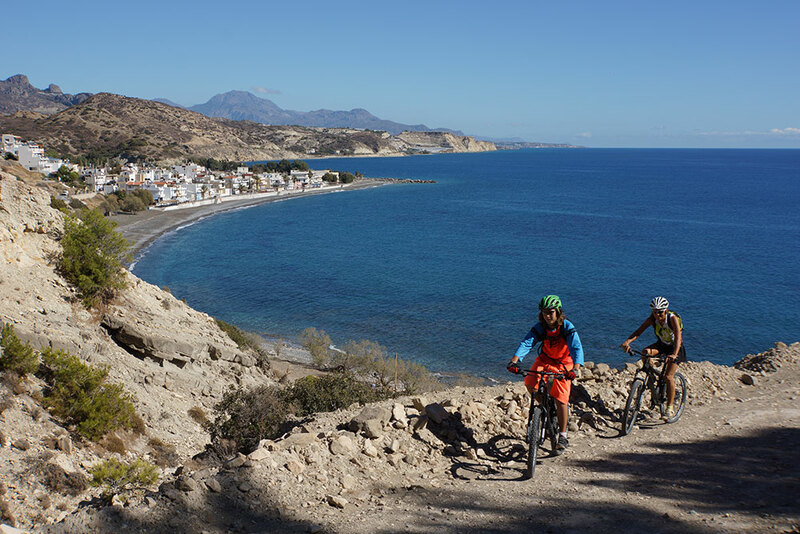 We bike to the south coast, near to the southernmost town of Europe, Ierapetra. We go through fragrant pine forests with many small valleys hidden in the rocky mountain villages, on lonely plains, such as Lasithi, Katharo, or Lapantos Omalos. There are also fantastic tours along the coast towards Elounda and you will find largely un-spoilt bays in Istron. Every day on the tour, we cycle to a nice mountain village taverna for lunch. For example, on the ISTRON tour every Monday, we go to the taverna of "Dimitri", and eat under the shade of the olive trees. All levels of group meet here to enjoy a well-deserved lunch. Since there are many beautiful bays and beaches around the Mirabello Bay, we often end the tour with a stop for swimming. After the peddling, it is glorious to jump into the crystal clear waters and get rid of the Cretan dust.